A free MP3 download of Johann Sebastian Bach's Toccata and Fugue in D minor (BWV 565) performed by the concert organist Frederik Magle on the famous organ in Riga Cathedral. In the spring of 1993 I went on my first concert tour to the Baltic countries, Latvia and Estonia. Among other places I played a concert in the magnificent Riga Cathedral (Latvia) on the 1883 Walcker organ which have 124 stops (144 ranks) and 6768 pipes. I have now made a live recording of Johann Sebastian Bach's Toccata & Fugue in D minor (BWV 565) available on the net for free download in very high MP3 quality. This rendering of Johann Sebastian Bach's Toccata and Fugue in D minor (BWV 565) is copyright Â© Frederik Magle and may not be altered or publicly redistributed in any way without express permission. You are allowed to link freely to this page. You are not allowed to link directly to the MP3 file (hotlinking) without clearly stating credits and linking to this site as well. The music has been uploaded for free download in accordance with Danish and international copyright law. Frederik. Denmark & Australia have Something in Common at The Moment,with Your Royal Family....However,I have Just Listened to this Recording.....We Have another Thing in Common......We BOTH agree on "The Tempo" of this Much Played Piece..What a Wonderful Instrument too.!!!!! Very Responsive,if Still a Tracker Action.???.... Well Done. Paul or Pamadu. Thanks Pamadu. It is indeed still a tracker action-organ! It was completely restored to it's original state by the dutch organ builder "Flentrop" in 1983, which is rather extraordinary considering Latvia was a communist state at that time. 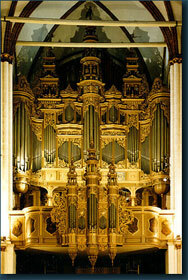 But basically the Riga Cathedral Organ was considered the pipe organ in the Soviet Union. I have in my collection many Melodia records recorded on this spectacular instrument. All in All... to the BOTH...and that gets me out of Trouble....hehehehehe Cheers Pamadu/Paul. What does the Organist,Himself Think.??????????????? Well, the two recordings are difficult to compare directly because it was two very different organs and very different concerts. Pamadu is pretty much right. First, I had a decent amount of time for preparations of the concert in Riga, and during the concert I had two "registration-assistants". The organ in Riga Cathedral (which is one of the finest german romantic organs in the world) can not be compared to the organ in Assisi, which was unfortunately in a very bad shape (missing notes in some stops, slow pneumatic action - long delay from pressing a key to hearing the sound - etc.). As for the concert in Assisi: When I sat down and played the Toccata, I did so without having touched the instrument before and making the stop changes while playing, guessing, using my experience and knowledge of organs in general. It was not a solo concert, but rather a concert featuring the Cecilia Choir (whom also had their own organist, Klaus Jerndorff, to accompany them). I just played for the fun! Still, I felt that my rendering of the Toccata and Fugue that evening had a certain "touch" that represents a part of my vision of playing Bach (and other music), thus I decided to post it on the net even though it's very "raw". But it can not be said to be generally representive of my current way of intrepetation due to the circumstances. What people (who are not organists themselfs) don't know is just how big a difference there is between the different organs around the world. I would say that - even if both were in equally good physical condition - the difference between an organ like Riga (tracker action, 124 stops) and the Assisi organ (pneumatic action, 15 stops) is just as big as between a piano and, say, a harpsichord (they both have keys and strings and that's about it), if not even bigger! The two simply cannot be compared and the playing style will have to be adapted to each instrument. That's part of what makes the organ so fascinating and challeging in my opinion. I rather like the playing of this peice. I have a couple of questions though. When chooseing your registration what made you choose your stops. I tend not to play most of Bach's music with the listed registration. One, because the organ i play at can't handel all of that and is only 2 manual. Two, i find that the music looses a certain amount of expression when the stops get too vigorous. Is this an acceptable opinion or am i jus unexperienced. Johann Sebastian Bach's Toccata & Fugue in D-minor - as performed by me in Riga Cathedral, Latvia in 1993 - can now be downloaded directly from this server as a high quality 256 kbps mp3 file Click here to download. J.S. Bach himself generally left very few registration suggestions, and none for this piece. So any listed registrations in the Toccata & Fugue in D minor are later additions and can be disregarded if you feel you have come up with a better registration yourself. So yes, it's an acceptable opinion, indeed. Now, whether your choices of registrations actually are better than the listed is a different question that I of course cannot answer without actually listening to your playing and knowing the instrument. A very fine organ played by a very fine organist! Thank you for sharing. I just want to update with a little piece of statistics-info: Over the last 5 months - since I moved the MP3 file to this server on June 25th - the Toccata & Fugue has been downloaded a total of 12,702 times and counting! That makes it the top MP3 download (as far as I can tell) of the J.S. Bach, Toccata and Fugue in d-minor (BWV565) on the entire internet!! I admire anyone who can play any type of keyboard. But most especially a large Organ. I have no idea how in the heck you do it, I'm not anywhere near that coordinated. Good tempo. The fuga really swings. All times are GMT +2. The current date and time is Apr-19-2019 13:13.